Primary schools signing up to the Buster’s Book Club reading reward scheme will have the chance to have a top children’s TV personality visit their school. 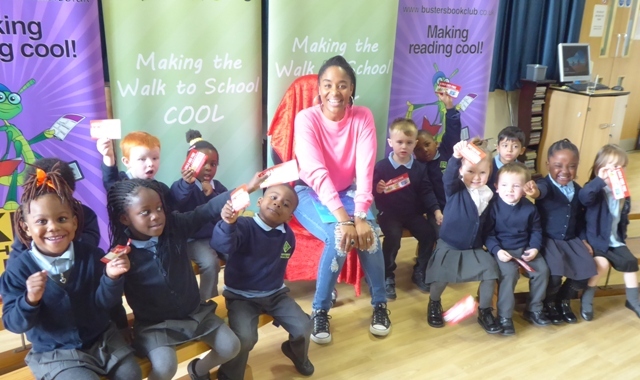 Joanna Adeyinka-Burford, presenter of the CBeebies television programme The Let’s Go Club, will deliver a story time session at the school taking the top spot in a countywide challenge next year. The presenter and actress is an honorary patron of the children’s educational charity the KM Charity Team for its work promoting child literacy and health and wellbeing in schools. Its flagship literacy initiative Buster’s Book Club is now open to schools wishing to register for 2019. Schools joining the reading reward scheme by 1 December will not only be eligible to take part in weekly and monthly challenges starting in the New Year, but also go into a prize draw to win 400 books for the school library. Buster’s Book Club uses friendly competition to motivate children to get excited about reading. It also encourages a team spirit as prizes go to the top or most improved classes as a whole. Rewards include the Reading Class of the Week Trophy and, for inter-school competitions, tickets to leisure attractions such as Wildwood, Leeds Castle, Revolution Skatepark, and Pirate Cove Adventure Golf. Classes with the most impressive reading figures in the county have the chance to win storytime visits from celebrities including Joanna and fellow CBeebies star Phil ‘Mister Maker’ Gallagher, along with award-winning children’s author and illustrator Nick Butterworth, and pantomime favourite and actor Ben Roddy. In the summer term, Joanna gave a lively rendition of Nicholas Allan’s classic picture book The Queen’s Knickers to delighted pupils at Gravel Hill Primary School. Last November, she read two books to pupils at Peareswood Primary School - Sue Hendra’s Keith the Cat with the Magic Hat, and David McKee’s Elmer. The Let’s Go Club is dubbed ‘the club that never closes’ and is packed with fun things for children to make, do, and discover. Joanna has been a key part of the presenting team since 2015 and her acting credits include Doctors, Holby City, and Little Britain. She also spent 13 years working in primary education as an expressive arts practitioner, helping improve the literacy skills of those with English as an additional language.